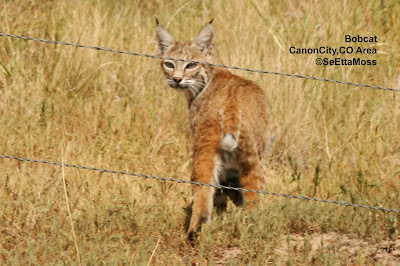 The previous bobcats I have seen were at dusk so I was surprised to spot this bobcat crossing a gravel road just south of Canon City at 6 pm in full daylight. 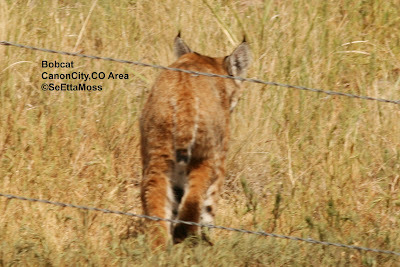 However a little research shows I shouldn't be surprised: "Highly mobile, the typical bobcat, according to Mallow, ranges widely in late afternoon and early evening, during the midnight hours, and through the early morning hours. In between the times of its longer distance movements, it forages and rests" (from /DesertUSA, a good website with reliable info). 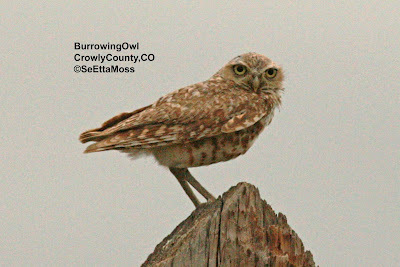 Note the bold bands on the back of it's tufted ears, which are a some identifying field marks. More field marks are the the bobbed tail and the bold bands on top of the tail. 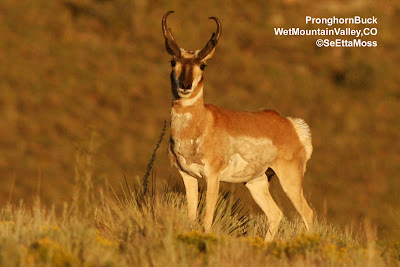 The handsome young buck pronghorn (no, they are not antelopes, they are pronghorn) was with a herd composed mostly of young males (that seems unusual?). I think they are such beautiful animals I had to enlarge his photo. I think the photos are enhanced by the warm glow of waining daylight just before sunset. Yesterday I drove up to Lake DeWeese to "chase" a very rare bird for Colorado, a Reddish Egret. Though it failed to show-up, I had a very pleasant day. Lake DeWeese is located in the Wet Mountain Valley, a high park that lies at almost 8,000 feet between the very scenic Sangre de Christo Mountains and the Wet Mountains. So the temps were in the low 80's in the afternoon while back in the Canon City area they were in the low 90's. After finding the Eastern Phoebe at Pathfinder Park this morning, I thought it might have been one of the two Eastern Phoebes I had seen last evening at my friend's property which is in the area. Whether it was or not, I was surprised to find a total of 3 Eastern Phoebes along with the juvenile Black Phoebe that has been staying by their pond for several weeks. The lighting wasn't good as it was late in the day and cloudy so I didn't see any yellow wash on their underparts, but I suspect 1-2 of these are juveniles. 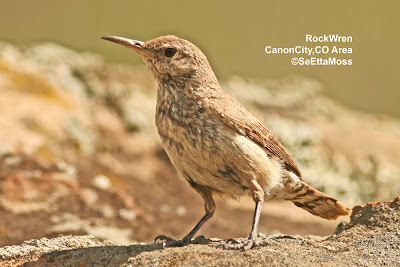 The bird in the top pic shows juvenile characteristics in the cinnamon buff edging shown on coverts. 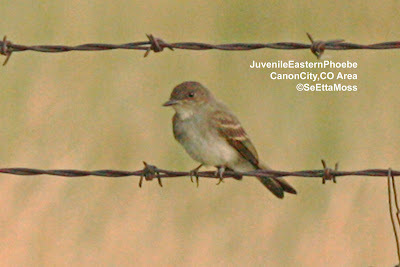 I birded Pathfinder Park near Florence,CO this morning to see if the juvenile Black Phoebes were still there. 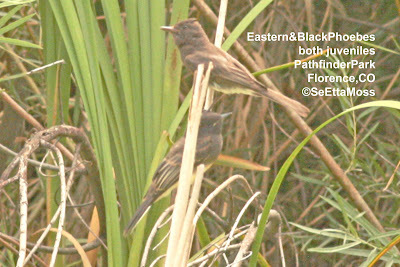 I only found one of the two juvenile Black Phoebes and it was calling frequently as it fed in the wetland area. Then a second phoebe flew into sight. I thought this was the second Black Phoebe, but no--it was a juvenile Eastern Phoebe. 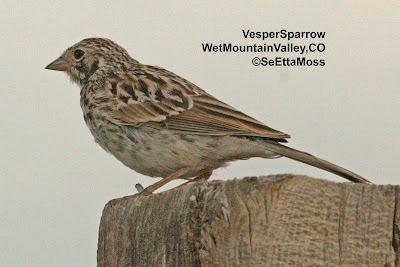 I got the top pic of the two as they perched quite near each other. They were about 75 feet away and I took the pic handheld so it is not great but shows how much more brown the Eastern Phoebe is, though the cinnamon edges to the juvenile Black Phoebe's plumage clearly stands out. 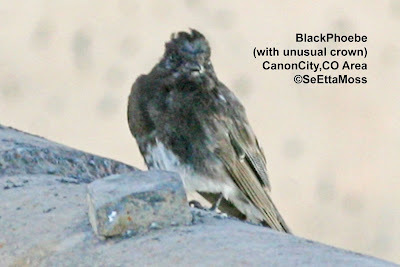 This is the Black Phoebe in the post below but 8 days earlier (photographed within 50 feet of subsequent pics). 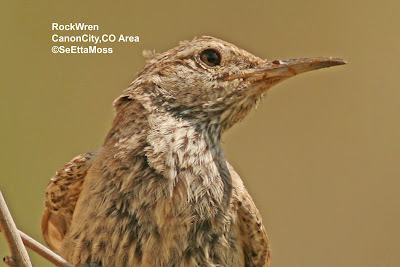 It has a odd crown plumage but the remainder of it's plumage isn't as rugged (except the rump area) though it has clearly begun to molt. Definitely it's median and greater coverts are still intact but clearly not so in the pics in the post below.